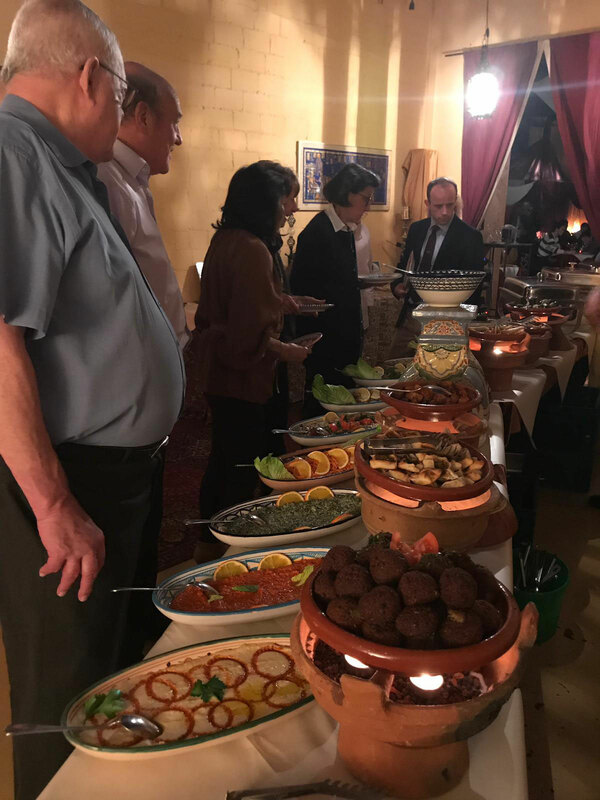 From 7pm members met for an apéro and later moved into the restaurant to enjoy the tasteful oriental cuisine, the arabian night ambience and entertainment. 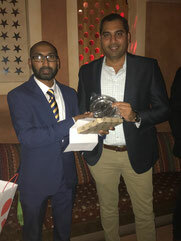 Despite (or maybe as a result of) the speeches & awards being hampered by other guests, members were spared the dulcet tones of the President and the captain delivering their speeches and the awards of Best Bowler, best batsman, best fielder & President's Award. 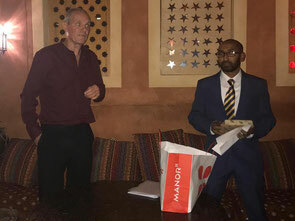 Welcoming the guests John Hallam reiterated his goal to ensure the club remains a club that does more than just play cricket. The social side is what has kept a lot of us together since our founding in 1982. Nevertheless, we are primarily a cricket club and like most members wants a successful team when it counts. We can save the social cricket team for friendly fixtures. Having been with WCC since the latter 1980s (back then there wasn't any "oldies" in the club), nowadays we have a lot of "oldies". The EOS dinner brings us together, but I think it would be good if more of our members bridged that generation gap. For example, it would be nice to see some ex-players turn up on a sunny weekend and enjoy a drink and watch the lads win. Alternatively the lads should/could come to the Restaurant Tiefenbrunnen after training on a Wednesday and talk nonsense with the "oldies". 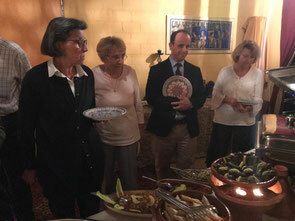 • He observed was that there was a good team spirit and thanked the committee for their efforts/dedication this season. He specifically thanked Vinny & Alex for organising tonight's WCC EOS Awards Dinner. Vinny has done an excellent job arranging social events. The cricket and BBQ event with the ladies, Zurich Sapphires CC, went well when one considers we made an organisational mistake in re-arranging a cricket fixture. The recent curry event was a success with a good turnout. Events don't have to be organised by Vinny, our social secretary. If you have a good idea and are willing to help just let someone from the committee know! Finally, don't forget that we still have one more event this year, the Christmas drink on Friday 14th December. • On the subject of cricket tours John commented that we usually start the season with a trip to Italy and play games against Idle CC. He had been disappointed & thought it was a real shame that we couldn't get the numbers together this year but I hope to organise it again for next year as it has proven to be a good team building exercise over the past years. From what I heard we had a successful tour to Prague but that is something for the club captain to tell you all about. John Hallam thanked the committee for their efforts/dedication this season. Moving onto the Presidents award. The Presidents Award is an award in recognition to a person who is not a committee member but still does a lot for the club. It is an award whereby the Presient decides who deserves the award. I'd like to mention Juli Pratt, who took the award last year, who advises the lads about their fitness and also administers first-aid at games when necessary. Also a special mention to Sahan who was very involved on the playing side helping with the pre- and post-match. 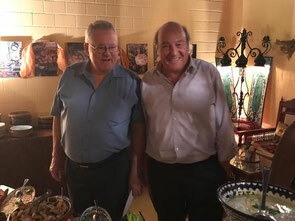 He was also heavily involved in making the Curry event a success. 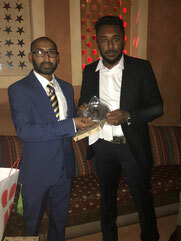 My choice for the Presidents award is Kasun Munasinghe who, like Sahan, was very involved on the playing side, generally always one of the first at cricket training so took the responsibility of preparing things. Kasun was the person who took the lead role for the Curry event and did a lot for this event. Thanks Kasun, and congratulations! Finally the President offered some words of praise to the club captain, Mohamed Sameel. Although we didn't win any trophies this year, Mo has built a stronger side and a team that are enjoying their cricket. The team is competitive and is moving in the right direction. Hopefully we can take the momentum into the 2019 season. Welcome to the end of Season dinner 2018. It has been an absolute honour and privilege to captain Winterthur Cricket Club. 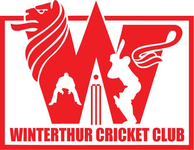 2018 was about rebuilding the team and the confidence levels of the players, and making Winterthur Cricket Club competitive. As a first step, I appointed a Vice Captain and put together a leadership group to which the committee was extremely happy for me to go ahead with. Wednesday net session were an absolute success, with a good turnout throughout the season, senior players like of Adam, Shay and Prafull attended almost all the sessions along with many more. Chris Lodge also worked with the bowlers when ever he had the time to come along to Deutweg. Changes were made in the way the doodle was sent out, and the team was announced on a Monday evening, so the playing XI was expected to turn up for the Wednesday nets. We started the season from where we ended last year... but it was expected. I remember when we lost the first match of the season, this made us question ourselves and this made us more determined and committed. We were 100 percent commited to achieve our goal of a 4th place finish in the CSPL we played some amazing cricket there on, bowling out sides like the Nomads and Olten under 35 overs. And who could ever forget that catch Pip took standing at point to dismiss Sara in the game against the Lions, that’s the kind of commitment we all showed through out this season. Unfortunately we missed qualification to the play-offs by a single bonus point to our rivals Power Winterthur. And finished in a respectable 5th place. Then we had to focus on our tour to Prague for the Pepsi Cup, we had am absolutely strong team, we were drawn into the toughest group. But we finished in a respectable 5th place as plate winners having only lost to the Champions and the Runners-up. 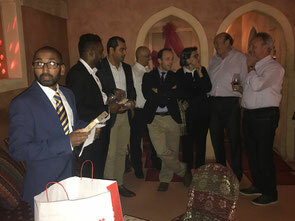 The highlight and the most talked about subject at the gala dinner in Prague was how WCC picked up all the individual award of Best Batsman, Best Bowler and Best Wicket Keeper despite being only plate winners. So we ended our season on a high and very much looking forward to the next season because we have only scratched the surface yet. I would like to thank, all my players for their time and commitment and all their wives and girlfriends who let them go play the game they love so much, and very special thank you to Juli Pratt on behalf of all the players and the club for her commitment to looking after the players." You can view photos of the WCC 2018 End Of Season Dinner in the website gallery. For more nformation on the evening, please contact Vinny Patel.